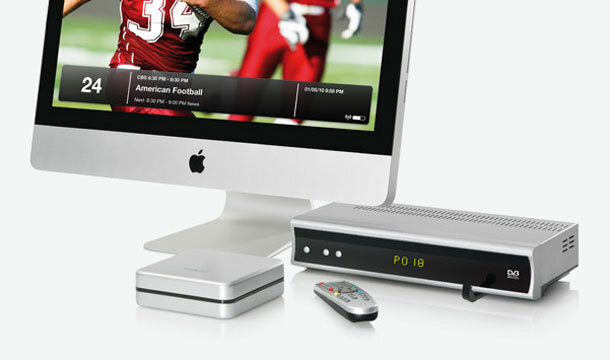 Elgato, the maker of EyeTV 3, the award winning TV software for Apple Mac has released the world’s first Digital Video Recorder (DVR) solution wich provides full access to premium cable or satellite TV on a Apple Mac – EyeTV HD. With EyeTV HD and EyeTV you can watch, pause and rewind TV programs; you can also search the program guide and create Smart Series Guides* to record the entire season of a TV series. EyeTV HD is easy to setup and only takes afew minutes. You simply connect the EyeTV HD to the receiver of the Cable or Satellite to your computer via USB, position the included infrared channel changer cable nearby. The EyeTV setup wizard then takes you through a few steps and thats it you are finish. When and if you need to record, EyeTV HD can you this for you and preserver the high definition quality of your pictures in H.264 format. To free up space on your hard drive EyeTV HD allows you to archive file/movies using Toast Basic disc-burning software. EyeTV HD has a unique dual format capture mode, wich allows you to record in iPad and iPhone at the same time. EyeTV HD also enables export to iTune from EyeTV. You can stream live HDTV to your iPad or iPhone via EyeTV. EyeTV HD can capture video from analog and digital sources such as a VCR or a camcorder. EyeTV HD includes component inputs for HD sources, as well as S-Video and composite inputs for standard definition sources. EyeTV 3 includes one year of free data from TV Guide, with optional renewal for only US$19.95 per year. An optional EyeTV app is available to stream live or recorded TV to an iPhone or iPad. Internet connection required to download Program Guide data. *Smart Series Guide functionality requires a TV Guide subscription.